If you don’t have on hand any amaro, aperitivi, crème de cassis, Chartreuse (yellow and green), grapefruit liqueur, vermouth from three countries, or a panoply of bitters, that doesn’t mean you can’t make a fascinating, well-balanced cocktail at your café. 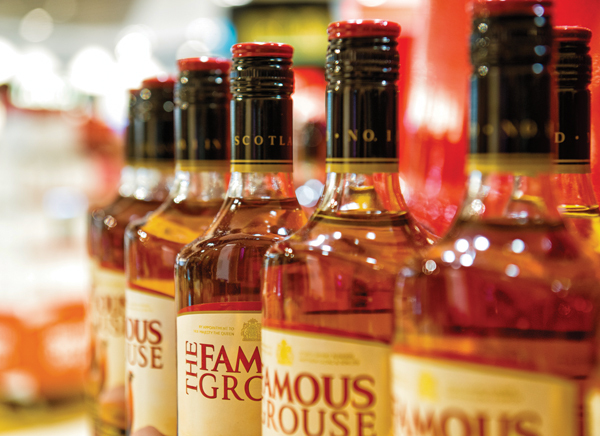 Even without a well-stocked bar, the world of contemporary cocktails is at your fingertips. 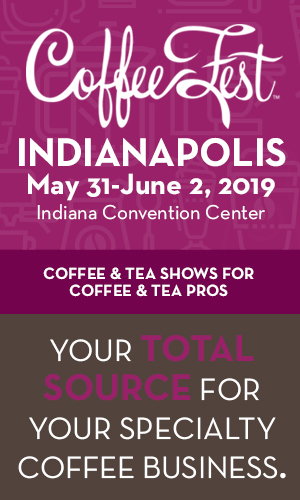 All you need is a single distilled spirit, a few basic pantry staples, and two things you do have and already know so well—coffee and tea. 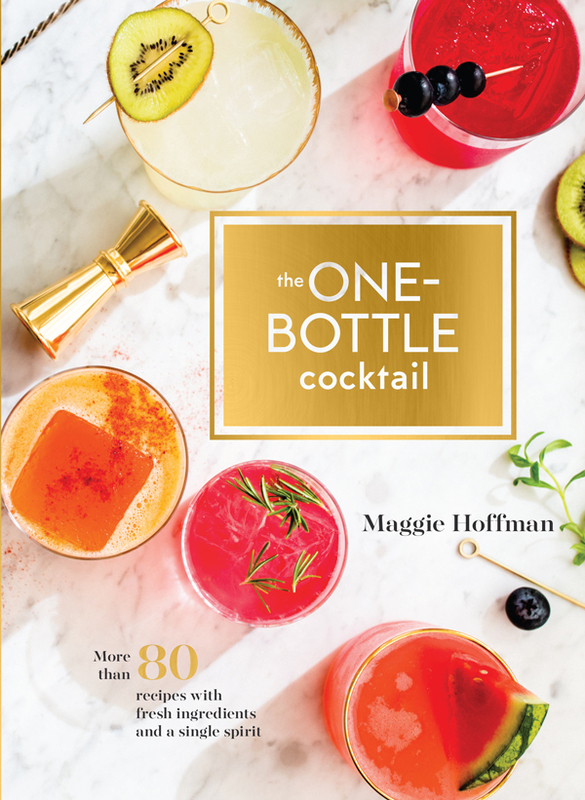 When gathering drink recipes for The One-Bottle Cocktail: More than 80 Recipes with Fresh Ingredients and a Single Spirit, I found time and again that top bartenders turn to tea as a source of tannin, body, and flavor. Tea can take the place of fortified wines, bitters, and liqueurs—and at a fraction of their cost. White and green teas offer a soft, malty, delicately grassy note, sometimes scented with jasmine, that serves as the ideal backdrop for drinks containing botanical gin and tequila. Rooibos deepens earthy flavors such as strawberries and offers a nutty note that serves as a bridge between fruit and brandy-based cocktails. Darjeeling, over-steeped until extra potent, but still almost wine-like in its richness, offers intriguing complexity when softened with honey and vanilla bean. 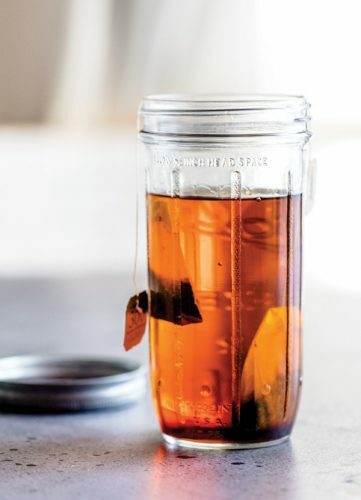 Earl Grey adds velvety tannins and bergamot flavors to a simple honey-sweetened whiskey drink called Barkeep’s Breakfast (see recipe, page 36)—and does the job of bitters without anywhere near the investment. Similarly, thanks to a little chai, no Angostura (or pricey Italian amaro) is needed to spice up the Dreams of Assam (see recipe, page 35), a warming, cognac-spiked concoction enriched with stirred coconut butter, which is a popular smoothie ingredient these days. If I had to choose one non-alcoholic cocktail ingredient to crown MVP, it would be chilled coffee. Few non-alcoholic ingredients are so strident and easy to mix with. 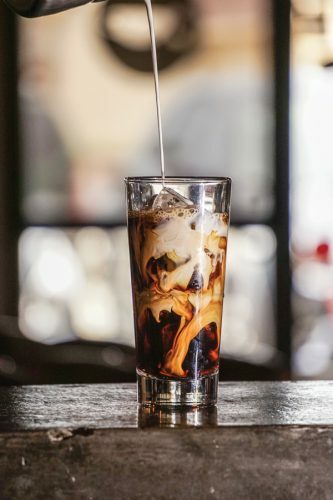 Chilled coffee cuts the sweetness of a cocktail masterfully, thanks to a bold, bitter note that’s usually provided by more expensive liqueurs. 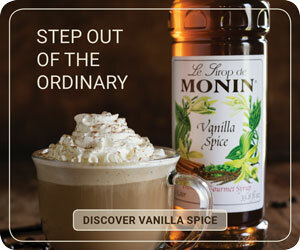 In addition to bitterness, coffee also can bring a cocktail over to the savory side, mingling beautifully with peaty smoke in the creamy On the Sly (see recipe, page 38). 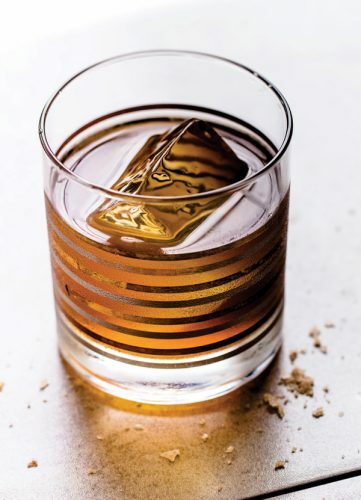 The Tango Nuevo (see recipe, page 37) also takes advantage of coffee’s savory, leathery quality, balancing sweet honey and rich aged rum with cold coffee and smoked salt in a combination that’s quick to make but far from simple in flavor. Note: If I’m not mixing these cocktails during daytime hours, I generally prefer to prepare them with decaffeinated teas and coffees, so as to not amp up any unsuspecting drinkers. 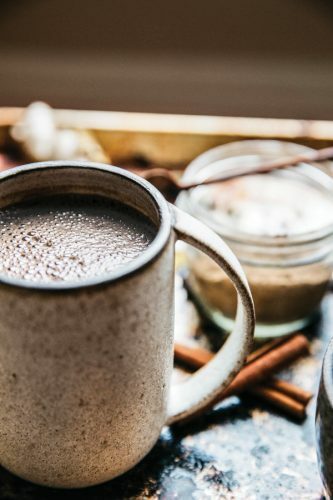 This soothing take on hot buttered rum gets its understated richness and subtle flavor from coconut butter—a mix of coconut oil and pureed coconut meat commonly found in health food stores and smoothie shops. Rather than adding spices one by one, steep a spiced black tea bag in hot water, then add just enough Cognac (or rye, or bourbon) to warm from the inside out. Pour boiling water over tea bag in a preheated mug and steep for 6 minutes. Remove the tea bag and add Cognac, sugar, and coconut butter, stirring until sugar is dissolved. *Coconut butter often separates at room temperature, so it helps to warm the container gently in a microwave or bowl of hot water and stir it before you begin. Earl Grey steeps in a jar of rye for several hours, infusing the whiskey with aromatic bergamot and earthy tea flavors. Stirred with fresh orange juice and honey, it makes an old-fashioned riff that’s citrusy, tannic, and delicately spicy. Combine honey and orange juice in a mixing glass and stir to loosen. Add infused rye and fill glass with ice. Stir until well chilled, about 30 revolutions. Strain into 2 ice-filled rocks glasses. Garnish each glass with a light dusting of cinnamon. Combine rye and tea bag in a mason jar or other resealable container. Let sit at room temperature for 2–3 hours. Remove tea bag and strain through a fine-mesh strainer. Infused whiskey will keep for several months in a sealed container. If salted caramel affogato were a cocktail, this is what it would taste like. Dark roasted coffee and aged rum were made for each other, but the really brilliant part of this drink is the addition of two pinches of smoked sea salt. One gets stirred in, the other is sprinkled on top of the ice just before serving. This drink practically turns your tongue upside down, hitting all the right notes—savory, salty, and sweet. Combine rum, honey syrup, cold brew, and smoked sea salt in a cocktail shaker and fill with ice. Stir until well chilled, about 30 revolutions. Strain over a big ice cube into a rocks glass and add club soda. Sprinkle a pinch of smoked salt on top of the ice cube and garnish with a lemon twist. Mix one part honey with one part hot water and stir until dissolved. This recipe may read like the formula for a coffee shake, but it has layered flavors that aren’t hidden behind a sugar sludge. 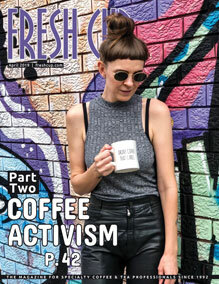 Cold brew creates a bitter backbone that’s shored up with a pinch of unsweetened cocoa. Allspice contributes a floral note, and maple a subtle sweetness. This drink works well with blended Scotch, but if you have a peaty Islay like Ardbeg or Laphroaig on hand, sub it in for a quarter ounce or so of the spirit to add a touch of smoke. A sprinkle of cayenne adds a little buzz on the lips. 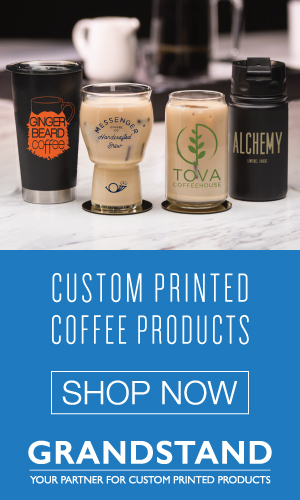 Combine Scotch, coffee, maple syrup, heavy cream, allspice, cocoa, and cayenne in a cocktail shaker. Fill with ice and shake vigorously until well chilled and very frothy, about 20 seconds. Strain into a wine glass and garnish with a sprinkle of allspice and cayenne.